"This is now Central Command for the Highborn Initiative." Living in the Grimm Fairy Tales Universe comes with its own set of perils. This is especially true if you're a Highborn, as there are countless foes seeking your death. One such Highborn is Britney Waters and Zenescope is putting her in a new role in Red Agent #1. The issue is written by Lou Iovino, illustrated by Diego Galindo, colored by Grostieta and lettered by Fabio Amelia. Britney Waters aka, Red Riding Hood, is recruited by a secret government agency to help take down a rogue organization that is determined to take out any and all Highborn threats across the globe. Using the codename Red Agent, Britney must infiltrate the mysterious organization and ultimately confront an seemingly unstoppable weapon called "The Knight" - a sadistic, laboratory-enhanced warrior whose sole purpose is to seek and destroy. The Highborns have long been a staple of the Grimm Fairy Tales universe so it only makes sense that there would eventually be a grander plot to systematically eliminate them one by one. It's that approach that Iovino capitalizes on in Red Agent #1, giving Britney Waters a chance to perform in more of an espionage role. At this point, just about all the characters in this universe are well-established, yet Iovino still manages to make Red Agent #1 feel something like a breath of fresh air. The script is pretty fundamental in its approach, but Iovino doesn't allow that to hinder the story's development. There's a clearly established adversarial relationship developed between Britney and The Knight that plays well as the story unfolds. The artistic style in Red Agent #1 is awash in superhero influences. Galindo renders each character and panel with a frenetic energy that gives the reader a great sense of the action. Britney looks easily recognizable in her "new" role as an agent of sorts and Galindo contrasts her more agile frame well with the more bulky opponent in The Knight. Much of the work features insets and overlays set against black gutters that better frame the action. The colors by Grostieta are largely darker and primary, with Britney's red jumpsuit standing out amidst fiery orange explosions. 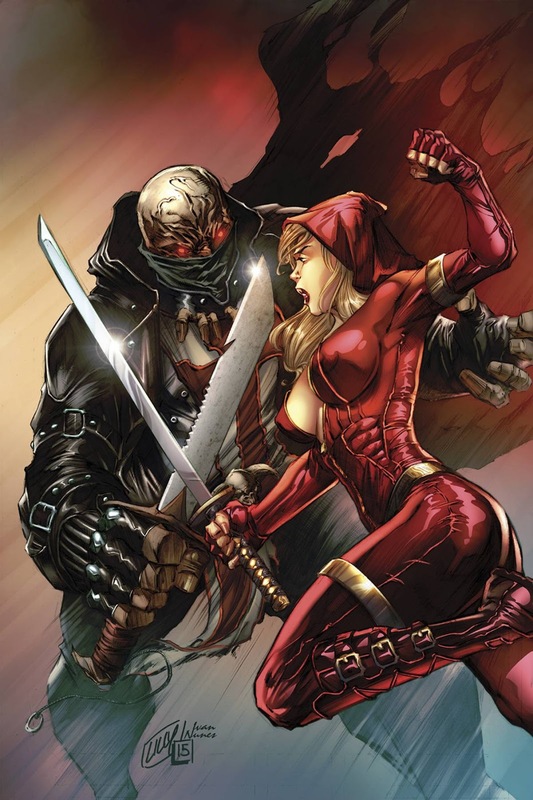 Red Agent #1 is a very ambitious take on a recognizable character in the Zenescope universe. Britney Waters always seems to be able to handle any situation, but it's clear from the first issue that she may have met her match. There's a clear direction that Iovino wants to take the tale and the first issue is a pretty solid foundation to build on. The artwork feels very clean, with Galindo's style sporting an action polish. Red Agent #1 gives fans of the character a new take on her that could work very well. Red Agent #1 is in stores January 27.